Perched high on the bluffs overlooking the muddy Mississippi River, Memphis is home to two “kings”: Elvis Presley, the king of rock ‘n roll, and blues master B.B. King. The city tour includes numerous historic, scenic and musically-important sites, such as B.B. King’s club in the Beale Street entertainment district and Graceland, Elvis’ home. For music lovers, Memphis is only part of the story. Add on a three-day trip to Nashville. While Nashville is best known for its role in country music, it has also been a recording mecca for all types of musical acts, from Bob Dylan to gospel to classical to rock. Make your own record when you tour Studio B, the historic RCA facility where Elvis and hundreds of other artists recorded more than 35,000 songs – including 40 million-selling hits! 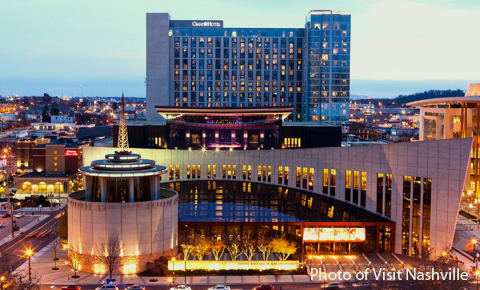 Our Nashville and Memphis vacation package starts in Nashville and ends in Memphis. This package can be customized to start in any sequence. This statue of B.B. King welcomes visitors to the heart of Memphis. 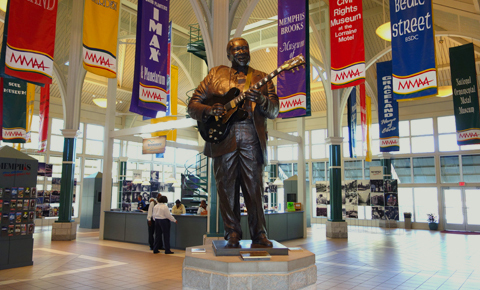 The “Home of the Blues” played a vital role in the history of early rock and roll, soul, and blues music. You can relive those songs every night at the clubs on Beale Street, or at the many museums throughout the city. You don’t have to be an Elvis fanatic to enjoy iconic Graceland, the ultimate rock ‘n’ roll destination! 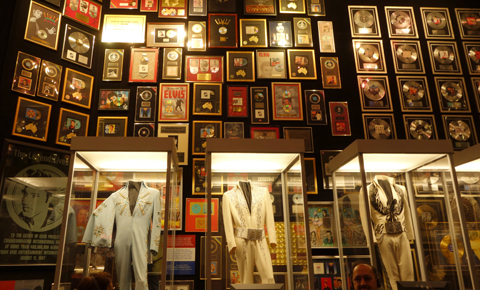 Fully immerse yourself in Elvis’ life, career, and influences as you visit the famous Jungle Room, the newly-enhanced trophy building, and his guitar-shaped swimming pool. 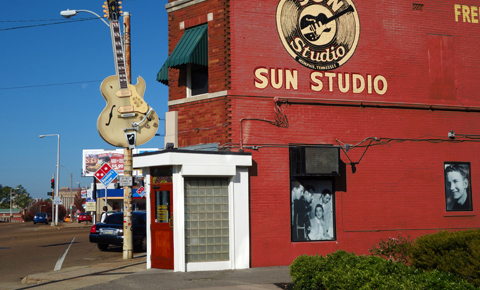 Explore Sun Studios, the “birthplace of rock ‘n roll”, where Elvis, Johnny Cash and Jerry Lewis begin their careers. The first rock and roll song, “Rocket 88,” was recorded at Sun in 1951. The Million Dollar Quarter – Roy Orbison, Carl Perkins, Cash and Presley – was also born here at an impromptu jam session. Tour the historic Ryman Auditorium — the “Mother Church of Country Music” and original home of the Grand Ole Opry, the longest-running radio broadcast in the world. Go behind the scenes in the stars’ dressing rooms and walk the wooden stage in the footsteps of Hank Williams, Garth Brooks and Bob Dylan. 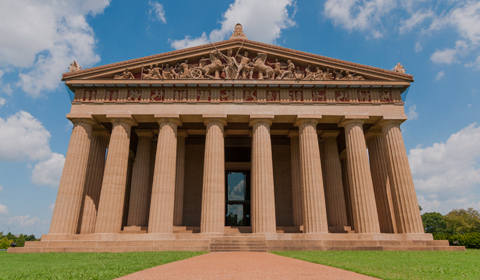 Music City is about more than music: the city embraces all the arts. The Parthenon – an exact replica of the ancient Greek temple – gave the city its first nickname as the “Athens of the South”. A 41-foot status of the goddess Athena, the largest indoor sculpture in the Western Hemisphere, is the highlight of the Parthenon art gallery. 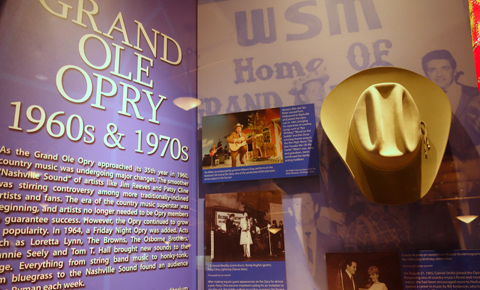 The Country Music Hall of Fame and Museum traces the America’s most popular genre from its roots in the Appalachian Mountains and the ranches of Texas through the Nashville sound to Taylor Swift and Brad Paisley. The facility covers 350,000 square feet with state-of-the-art exhibit galleries. Nashville and Memphis classic vacation packages include 5 night accommodations and multiple guided group tours. Nashville and Memphis deluxe vacation packages include 6 night accommodations and multiple guided group and private tours. These packages can be customized to any length. Home of the Star’s Tour: This driving tour features the homes of country music greats such as Taylor Swift, Toby Keith, Kid Rock, Dolly Parton, Hillary Scott, Martina McBride and more! Experience a fully guided backstage, behind-the-scenes, dressing-room tour of the Grand Ole Opry House,* where the world’s most beloved, and longest-running live radio show is still performed. Stand on the hallowed circle front and center on the famous stage, where the greatest voices in country music have stood and performed for so many years. Included in the tour is a visit to the world famous wax attraction, Madame Tussauds Nashville. Mississippi River Cruise terminal is located walking distance from Downtown Memphis hotels. Afternoon Grand Legends group tour. Tour includes a backstage dressing room tour of the all new Opry House and get a behind the scenes look at country’s most famous show – a true entertainment phenomenon! Included in the tour is a visit to the world famous wax attraction, Madame Tussauds Nashville.